The first game on the 2013 NFL schedule features Peyton Manning and the Denver Broncos hosting Joe Flacco and the defending Super Bowl champion Baltimore Ravens on Thursday, September 5th. 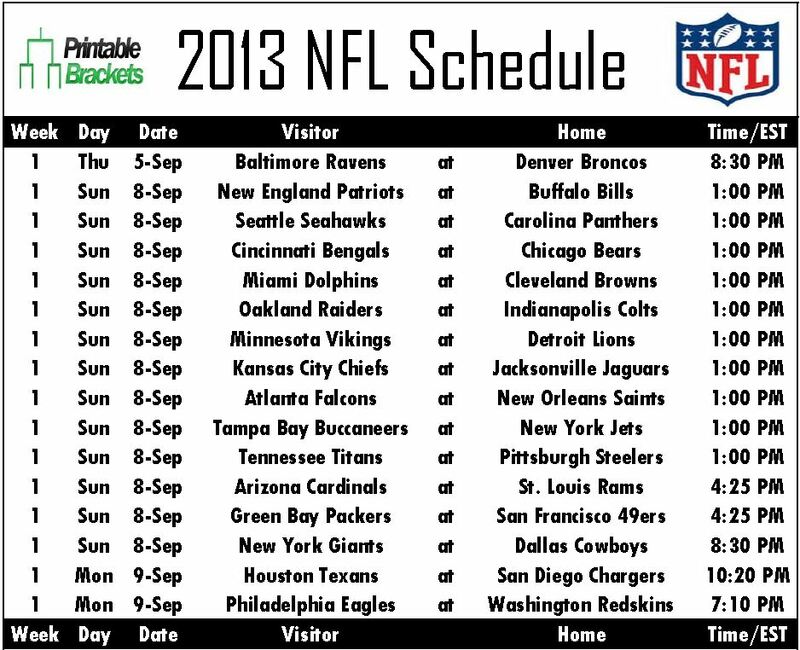 You can download and print the complete 2013 NFL schedule instantly and for free on this page. There are also individual schedules for all 32 NFL teams, as well as NFL pick em sheets for all 17 weeks of the season available for at no charge courtesy of PrintableBrackets.net! The 2013 NFL schedule opener is a rematch of a wild divisional round playoff matchup. The Ravens went in to Denver and stunned the top-seeded Broncos, 38-35, in double-overtime last January. The Ravens forced overtime when Flacco connected on a 70-yard touchdown pass to Jacoby Jones late in the fourth quarter. The Ravens then went on to knock off the Patriots in the AFC Championship Game en route to beating the San Francisco 49ers, 34-31, in Super Bowl XLVII. In other notable Week One games on the 2013 NFL Schedule, the 49ers will host the Green Bay Packers in another playoff rematch. The New York Giants will be on the road to renew their rivalry with the Dallas Cowboys in the first “Sunday Night Football” affair on the 2013 NFL schedule. Week One of the 2013 NFL schedule will conclude with a “Monday Night Football” doubleheader, as the Philadelphia Eagles will meet the Washington Redskins, while the Houston Texans will clash with the San Diego Chargers. In addition to the traditional division rivalry games, there are more than several notable games on the 2013 NFL schedule. In Week Two, Peyton and the Broncos will travel to the Meadowlands to face brother Eli and the Giants. Peyton will take on his former team for the first time when the Broncos are in Indianapolis to meet Andrew Luck and the Colts in Week 7. Peyton will also rekindle his rivalry with Tom Brady when the Broncos battle the New England Patriots on November 24th.